Along with NASA’s InSight lander, Curiosity is now one of only two functioning probes on the Martian surface. The Opportunity rover has been incommunicado since a massive dust storm encircled the planet last summer, knocking it out of commission, possibly forever. Curiosity, which has been exploring the Martian surface since 2012, continues to truck on, despite badly worn wheels, a drill that required some serious jerry-rigging last year to make it work again, and a memory glitch that limited its capacities. Curiosity is in Gale Crater where it’s been exploring iron-rich minerals in Vera Rubin Ridge for well over a year. Data gathered by the probe suggests rocks within this ridge formed from sediment that collected at the bottom of a now-dried up Martian lake. As to why these rocks aren’t eroding at the same rate of the bedrock around it, however, remains a mystery. Having explored the area in detail, project scientists at NASA have now directed the probe to head towards a new region – a “clay-bearing unit” dubbed Glen Torridon, according to a NASA release. The rover will spend around a year exploring this region in its ongoing search for signs of prior habitability. On December 19, 2018, Curiosity used its Mast Camera to capture a 360-degree panoramic image of its final work area at Vera Rubin Ridge, specifically a drill site known as Rock Hall. The composite image consists of 112 photographs, showing the future work area, the floor of Gale Crater, and the majestic Mount Sharp in the background. The colours in the image were adjusted to show what the rocks and sand would look like under daylight conditions on Earth. Curiosity’s new work area, described as a trough between Vera Rubin Ridge and the mountainous area surrounding the crater, looks promising in terms of its scientific potential. Prior surveys made by NASA’s Mars orbiter suggest the rocks in this region are filled with phyllosilicates – clay minerals that form in water. Data collected at Glen Torridon could tell us more about the ancient lakes that once peppered Gale Crater during the early history of the Red Planet. 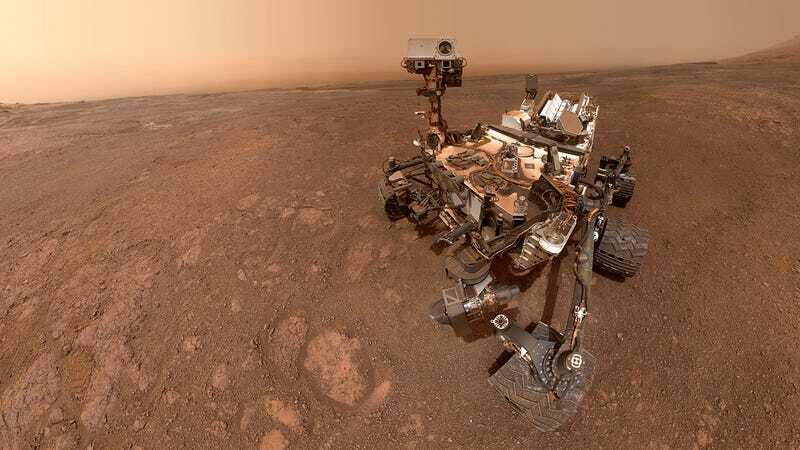 Curiosity took this selfie on January 15, 2019. Indeed, Curiosity has already uncovered traces of clay minerals and organic molecules on Mars. On their own, organics aren’t suggestive of life, but they are the raw ingredients required for life. The prior presence of liquid water and organic molecules on the surface suggests the planet was once capable of fostering life, but more data is required to prove it. By exploring the clay-rich deposits at Glen Torridon, Curiosity may uncover evidence of the prior environments in which this hypothesised Martian life could have emerged.